Serve with rice or as a bite size appetizer. You can cook in a crock pot or stovetop. I elected to use a crockpot for the ease. Place the pineapple, soy sauce, crushed red peppers in the pot. Mix well. 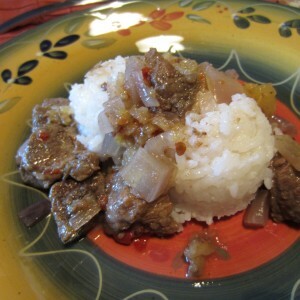 Stir in the beef and chopped onion and coat throughly with the liquid mixture. Cook on medium high heat for 3-4 hours. All crock pots heat differently, so keep your eye on the pot while it is cooking to ensure it doesn’t overcook. That’s it folks. Plate it over rice or put each bite size beef piece on a platter with a toothpick for a hot appetizer. Six beef bites are in the neighborhood of 195 calories. These also make perfect appetizer kabobs. Cut wooden skewers into thirds. Slide on two beef bites mushroomed between a cherry tomato and red or yellow bell pepper slice. A perfect beef bite slider!